I made a quart today using distilled white vinegar, rusty barb wire, and kept it hot in a double boiler for three hours. Normally the reaction takes weeks. To speed this reaction heat will do it. So, I heated it. Is it supposed to come out a dark blue on veg tanned leather? I was hoping to use it on a hunting bag. The bag is going very slow and tedious. I don't want to dye it blue! The scrap was dipped after 1 hour of reaction and the darker side about 3 hours. The lighter blue band is a single dip only. Looks black to me. But picture tones are often different than the naked eye. I love the smell of Walnut shavings in the morning! It is normally blue-black when applied. Sometimes it is more brown. It dries gray and darkens again when you put mink oil or something like it over top. I then finish with shoe polish or Fieblings Antique Finish. The great thing about it is that it is pretty permanent and doesn't run or wash out. If you want a more controllable color, you have to use leather dye or stain, but you are going to use a lot more, and have to rinse it good. I keep a large bottle of vinegar with some wrought iron in it. As I use it, I add more vinegar. Generally, it is sitting for weeks before being used, and the leather is as dark as it is going to get in a few minutes. I sometimes make a couple of applications if I don't like how dark it is. Go with your second application and then add some oil to it. I don't like dip dying this concoction. I had the exact same reaction on my 1803 rifleman's bag, blue grey upon initial application. Added a second coat which got darker with less of the blue grey color. After everything dried I applied neatsfoot oil and the whole thing turned a beautiful black. 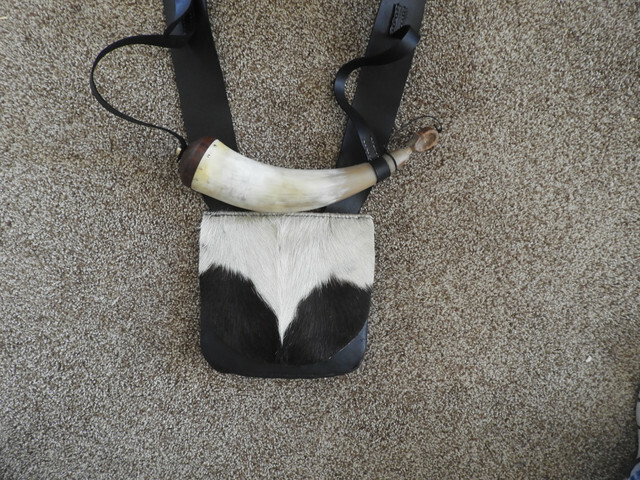 My son works a lot with leather, making and selling rifle slings. I passed this method on to him, and he will experiment a bit - saves a lot of leather dye! 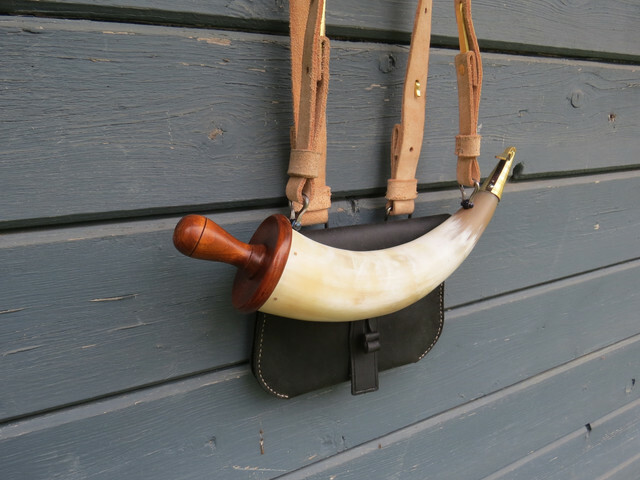 Really like that pouch and horn, David - you done great work! I will learn how to do that stuff soon, but busy with both healing and doing things to my flint build. Thanks for showing all the stuff - really neat. I often use ferric nitrate solution instead of vinegaroon. Seems to give up a better black. Some leather is lacking in tannin and can be improved by soaking it in strong tea. I've been putting this on the shoes I make since I started because it is easier to manage than black dye. A couple of coats and it is even from the first. My Old Master taught me that the deeper black came when the old timers greased up their batts and bootees back in the day. The only time I ever got the blue was when I tried it on a maple stock, and still don't know why. Just FYI, cider vinegar is more acidic than white, although they both work. The cider vinegar may work a tad faster and more thorough. Today it produces just plain black. 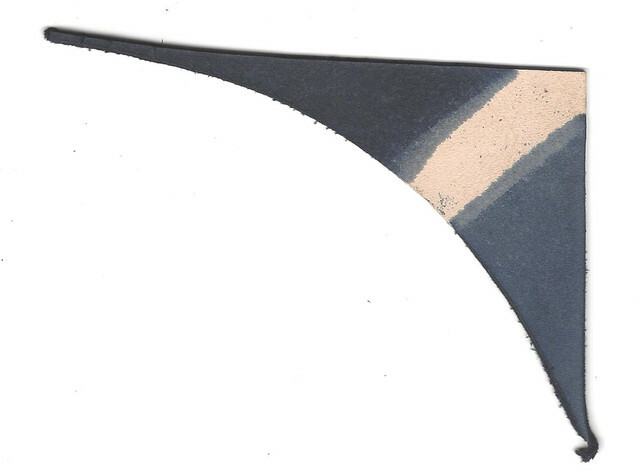 I suspect the partial reaction produce a blue color, like rust blue on steel. I also made a batch with cider vinegar, black iron oxide powder and steel shot. It produces a black-brown. Do not neutralize the leather. I once did that with baking soda and it caused the leather to dry rot in short order. I now stain, let it dry, and then stitch it together. I use shoe polish or antique finish to darken the stitches afterward. I don't know if it is the best process, but it were experience had brought me. You might also try using a different metal source, been wanting to try using steel wool myself. Would produce a much higher surface area of rust to react with the vinegar. Similar to the old iron fillings technique. I put degreased steel wool in the jar of vinnegragon. I' ll let it age and see on the next project. I used scraps of old (older than me, and I’m 60) barbed wire from an old fence line on my property. I just cut it up in pieces small enough to fit in a quart mason jar, covered it in cider vinegar, and let it sit. Whenever I need some, I pour a small amount into a smaller glass jar for use. It does have a blueish cast, but finishing with neatsfoot or mink oil, and a coat of shoe polish (brown or black) really makes it look good. Do you seal the shoe polish with anything ? If not does it rub off with use? It was black Lincoln dye, and I treated it with neats foot oil. I put a wad of degreased steel wool in the jar with the vinegar stain. A couple of weeks later the color produced is plain old black. I think the new stain was producing a vivid blue, much like blueing steel, vs boiling a browned part then boiling it to produce black. Before it smelled of vinegar and produce blue. Now it dows not smell and makes black. Making blue color with "young" stain is worth remembering if one want blue. This stuff will stain the dickens out of anything it touches such as sneakers, and various other atricles of clothing...ask me how I know. It was only about 4.95 for a pint. Might be worth a try. The blue tint could be coming from impurities in the metal being used...zinc could be the culprit. My first batch made a Blue / Gray color stain. Which I liked better than the pitch black. Steel wool is oiled. Even soaking in acetone will not get it all out. Old rusty stuff is better. Just a FYI, I tested a batch that is about 3 years old. Almost instant black, so I guess vinegaroon will last a good while.